With the new console Access Management Console the assignment of Load Evaluator is moved to a location where you really need to search for it the first time. For an overview which Load Evaluator is assigned to which server you still need to use the old Presentation Server Console (Configurator called in XenApp 5). The Load Evaluators Manager displays you exactly which server is using which load evaluator. With a few clicks you can assign a different load evaluator to one or more servers. Additional the tool has the possibility to create a "maintenance" load evaluator. This one is based on the scheduling rule, without any allowed access time assigned to it (taking care that the server will report a full load and no connections can be set-up). Because this functionality is available it would be great to extend this utility with the option to create custom load evaluators out of the tool. The XenApp Logon Manager is a very basic utility to control the logon settings of the Terminal Server. Select the server or servers on the left side, choose the desired logon state and push the button to enable or disable logons. 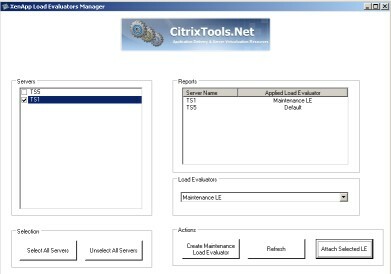 Also the tool shows a useful list of the current logon state of the servers in the Citrix farm. This is the latest tool that has been published by Pierre. With this tool it is possible to import and export Published Applications with their corresponding settings just like the tools I described in this glance at free article about Import/Export Published Applications. You have the possibility to export to file (you need to specify the name of this file). In this file the selected applications will be exported. 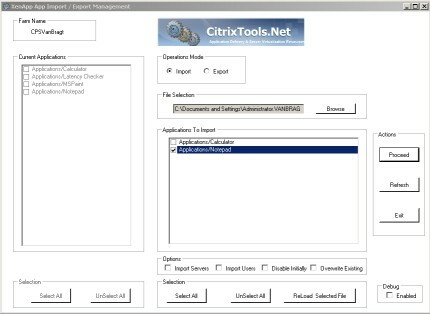 When importing from the file you can select which application(s) you will like to restore (import) into the Citrix Farm again. In comparison with the other tools this one is a bit different. The XenApp Session Cleaner is kind of keeping your systems in good shape utility. Session Cleaner logs off disconnects session, deletes local profiles and schedules reboot. The configuration can be set using the configurator which configures the settings on the selected server. On this server a new service is created which arranges that the settings will be carried out. This service reads the configuration out of a file located in the installation directory. Logically because of this the installation is more complex than the other tools (during the installation the configuration is already set for the server you are installing the Session Cleaner.